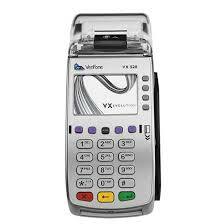 The Verifone VX520 is a great machine to use with either an AMS retail merchant account or mail order merchant account. Call Today to Order Your Free Credit Card Terminal! Need basic processing without all the extra features? If so, the wholesale priced Verifone VX-520 is what you need. The Verifone 520 is a straight-forward and easy-to-use terminal that will make transaction processing quick and easy for your employees and customers alike. The unit features a large display that will guide your employees to successfully completing a transaction. Easily add on a PIN pad to accept debit cards and a receipt printer to print off receipts.